How cool is this example of beautiful motoring? And I don't just mean the model behind the wheel. Although in my opinion models like her did add a bit of class to car shoots. Elegant and beautiful you can see them behind the wheel of a car like this. It has been said this car the BMW 700 LS Luxus Coupe is the car that saved BMW. Things weren't going that great and they had to come up with something cool, that worked and didn't have a door at the front. See Isetta or BMW 600. So starting fresh with the chassis but keeping the same flat twin, now up to 700cc, this is what they came up with. And isn't it beautiful. What is really interesting is that Wolfgang Denzel, the guy who built the Denzel, designed the body for BMW. He was at this time the BMW importer in Vienna. Small world. The concept was then developed inhouse at BMW into a coupe (above) and two door saloon. 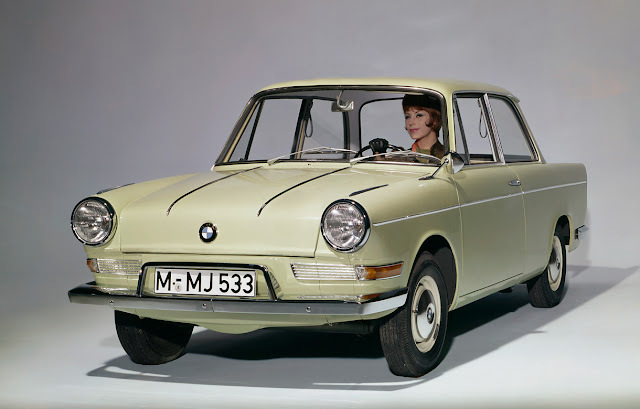 The unveiling of the BMW 700 was met with a standing ovation - how many cars would receive one of those these days. A beautiful looking car with a top speed of 78mph and 47mpg it was a winner and the start of great things for BMW.